This 75 year old man presented with weakness. His blood pressure was 220/80. He was found to have renal failure. He ruled out for MI. There are 4 mm of ST elevation in leads V2 and V3, but it not out of proportion to the very large (greater than 50 mm) preceding S-wave. This is typical of severe LVH with repolarization abnormalities. It would be an unusual EKG for anterior STEMI. In fact, it is very difficult to find a case of anterior MI with extreme voltage like this; this is probably because profound ischemia of LAD occlusion (STEMI) alters the QRS voltage and attenuates the severity of the electrocardiographic LVH voltage. If anyone out there has such a case (proven LAD occlusion with very large voltage suggestive of LVH), please send it to me! Not just the normal R-wave progression, but the high voltage S-wave. In fact, LVH of this magnitude often has no R-waves. No excessive concordance, Would a posterior ECG help to Dx the anterir MI in the face of this presentation of LVH? Or you are saying the voltage likely would be altered therfore wouldnt i be likely to get my excessive concordance STE? Any concordance would be excessive. You must mean excessive discordance. Nothing about this would change with a posterior ECG. I believe posterior(left and right) leads should be checked. Isnt the ST elevation on V1-V3 reciprocal changes to the ST depression I expect from the hypertrophied posterior left ventricular myocardium? If you recorded posterior leads, there would no doubt be ST depression, but it would still be discordant to a positive QRS, and in this case it would still be proportional. It would not help in the diagnosis. Abnormal repolarization would still all be due to abnormal depolarization, and not to acute MI. A basic question.... This pt has severe LVH, but no LAD, perfectly normal axis.... Any reason for this? I can only say that LAD is not unviversal in LVH. The axis is clearly to the left and inferior (V4-V6 and inferior leads), but it does not have a superior component that would lead to LAD on the limb leads. In that ekg pattern, I would make sure with biomarker first and then, if I suspect MI in high risk patient , I would activate Cath lab. I think , not much confident to stay cool with that ST elevation in High Risk Person . This ECG would very rarely be due to anterior MI. Any ECG can hide ischemia. Acute occlusion can present with a completely normal ECG. So one cannot say there is no underlying acute occlusion. 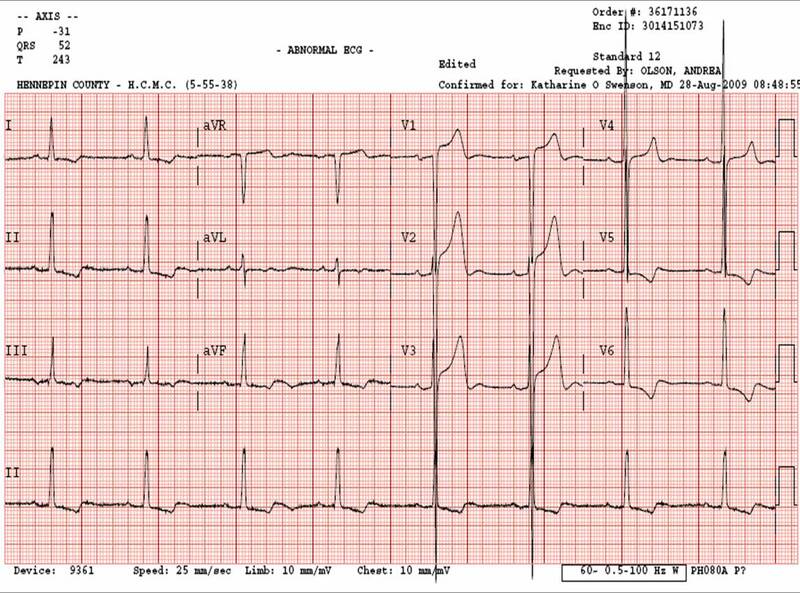 One can say however, that there is no finding on this ECG which is, or could be, due to that occlusion. Will have to check cardiac enzymes to be sure.